This pose brings excitement and intrigue. We're literally offered a new perspective as we get to see the world upside-down, which offers fresh insight. Inverting this way brings fresh blood to your face, invigorates circulation, and prompts you to keep breathing especially when life seems scary or challenging. Handstand also encourages us to make time for play. In a culture of doing, it’s a beautiful reminder to just be, especially since a safe and successful handstand requires relaxed concentration and a state of deep presence. It’s also a deeply humbling pose in its evolution, from that very first kick on the wall to eventual free-balance. In this process, Handstand asks us not to take ourselves quite so seriously. We tap into ancient wisdom by practicing Anantasana. The pose is named after a mythological serpent, Ananta, who cared for Lord Vishnu. The snake mirrors our own reptilian brain, the natural impulse to act in the face of danger and to rest in times of peace. You’re encouraged to allow a snake-like energy as you uncoil the intercostal muscles between your ribs on your supine side-body. Let your instinctual self guide you to unfold the top leg and stretch through the heel. Release into innate, timeless wisdom as you draw breath and direct it to the spine – the home of your nervous system. Home of intuition. Half Moon is the definition of balance in the face of challenge. Its moon energy brings balance and grounding, while its sun energy requires strength in the standing leg. It also balances fearlessness in opening into the pose with only one leg to support you with the softness of balance and flexibility. Like the waxing of the moon, this pose invites us to open fully, allowing a free, luminescent energy to radiate from the center of the heart outward. Balance in this pose requires awareness in the feet, strong lines of energy throughout the legs and arms, and a powerful, focused breath. Half Moon reminds us of our own capacity for balance, stillness and self-support; it reminds us that however life sways us, we can choose to remain expansive. Ardha Matsyendrasana is healing, nourishing and transformative. The depth of the twist is key to the whole pose. It both strengthens and stretches muscles that straighten and rotate the back, as well as firing up the digestive system. It also clears the lungs, as you’re encouraged to take full, deep inhales and exhales in supporting the digestive system and its capacity to eliminate waste. Taking pride in yourself as you sit tall, you at once create space in the upper vertebrae and sweet release in the lower back. This sacred pose brings us face-to-face with our capacity for nourishment and self-healing. We’re called to sit proudly in this posture. The spine is long, the shoulders relaxed, the crown of the head reaching skyward. Like a marionette, as each line of energy is pulled, it will affect energy elsewhere. An energized torso requires openness in the pelvic area; without it, you’re likely to compensate by hunching the shoulders and fighting against your core. As you work with this pose, you’ll be rewarded with a feeling of freedom when all the pieces lock into place. Energy is cleared from the hips that makes it easy to proudly stretch through the spine. All the while, radiating energy from the heart center and maintaining a steady, calm, focused gaze. Baddha Konasana calls for courage in a place of vulnerability. Since tension is often held in the hips, you may encounter mental clinging even as your body invites softening. By relaxing and allowing yourself to release, you learn to trust the process of unfolding. In a hectic modern world of seemingly endless expectations, surrendering to Child’s Pose is a sweet escape. Though usually taught to beginners as a rest between more difficult poses or strenuous flow, Balasana is valuable in its own right. This pose is therapeutic for calming stress, as it quiets the mind and centers the nervous system. Physiologically, it is also an excellent passive stretch for the back body, including muscles along the spine, ribs and lower back. It is a gentle, welcoming pose for yogis of all experience levels to find relief from back and neck pain, as well as unrelentingly distracting thoughts. Child’s can be practiced passively, with the arms relaxed along the side body, or more actively, with the arms stretched overhead. It’s a chance to tune in to your body’s needs in determining which variation is best for the present moment. By accepting the invitation of Child’s Pose, you’re accepting and supporting yourself just as you are. It is one of the simplest backbends from which beginners find their way to full opening in more complicated asanas. However, despite its simplicity, Bhujangasana includes all beneficial traits of backbends. The basis of any backbend is maximum extension which improves blood circulation, evenly distributing energy over the spinal column and giving us a unique feeling of free space inside. In this asana, hands give support with little effort (as a cobra does not have hands at all). We instead rely on support actively working legs to enable an upward stretch. After maximum extension of the spinal column is achieved, we enter the asana by the deep backbend, opening the chest and expanding the lungs as much as possible. The eyes look upward. The heart is open. 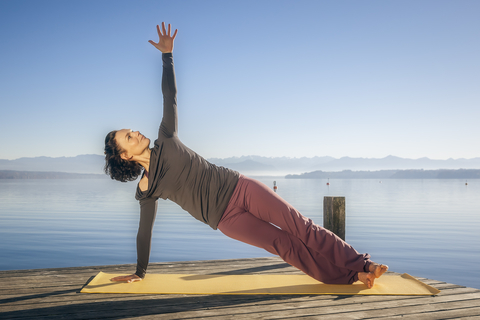 When practiced with attention to alignment, this pose exudes a quiet strength. Though beginners may feel that Chaturanga is focused on shoulder and arm strength, it’s actually a test of full-body awareness. By bringing strong energy into the legs and core, you release the burden on the arms and improve overall posture. In some ways, it’s a taste of the body awareness required of successful arm balances. You’ll quickly learn where you need to develop strength by holding this pose for even just a few breaths. If it’s your core, your lower back will droop; if it’s your legs, your arms will tire from carrying too much weight. In this way, the pose is your teacher, albeit a demanding one. Use this information to build strength in weaker areas and to teach yourself body awareness where you normally rely on brute force. Stay patient with the learning curve and you will embody the full expression of fierceness, strength and self-reliance that this pose has to offer. Bow, like most mid to advanced backbends, requires care, attention, and courage in its practice. With the belly pushing into the floor and the back arched, it’s a healing pose for digestion and reproductive issues. Yogis can even rock back and forth while in Bow to feel an intestine massage and improve their belly circulation. In fact, what makes Bow special among all other backbends is its balance between belly organ stimulation and low back flexibility. The front body, including the sternum and shoulders, are encouraged to expand in this pose. Many of us are hunched forward for most of the day, so this pose is like airing out the lungs and shoulders. Quadriceps are also provided a powerful stretch, as hands reach back to grab ankles, thus completing the pose’s beautiful bow-shaped namesake. 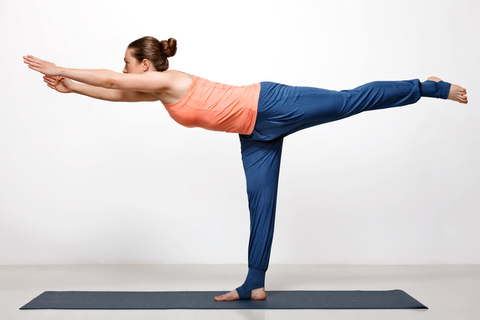 'Eagle' pose embodies so many aspects of balance; challenging both mind and body. Not only standing on one leg, but wrapping the free leg on top and co-ordinating this with a bind of the arms; creating a deep connection to the yogic core and harnessing concentration. Simultaneously internally rotating and in flexion, the hips are stabilised; just as important as working on their opening. As well as strength, Garudasana builds flexibility (of the knees, ankles, shoulders and wrists). We open the often-hunched-up space between the shoulder blades and allow it to breath. Grounding through the feet and root chakra empowers our connection to the earth, while standing on one leg harmonises the left and right brain and the corresponding subtle energy channels of 'sun' (pingala) and 'moon' (ida). Halasana is a pose that should be practiced with the utmost care and patience. Because of its potential to tax the neck and spine, you are cautioned to trust and honor your limits. When practiced with proper awareness, though, it is deeply rewarding. By stretching the vertebral column, this pose relieves pain in your back immediately and long after you’ve left the mat. It breathes life into the entire nervous system by soothing the precious spine. Doing so impacts everything from back flexibility to your mood. This pose utilizes the power of gravity to stretch the hamstrings. Since you’re upside down, there’s little you can do to force the hamstring opening; instead, Plow offers us the chance to close our eyes and accept the gift of release that comes with staying patient with the pose… and staying patient with ourselves. This introspective forward fold lengthens the hamstrings and lower back, opens the hips, and helps the practitioner to move into a place of silence, stillness and surrender. With one foot drawn into the opposite thigh and the knee extending open toward the side of the mat, Janu Sirsasana creates a gentle hip opening action in the pelvis. Lengthening the back body and releasing the weight of the torso over the extended leg, creates a release through the lower back and deep into the glutes and hamstrings. A subtle engagement of the core allows one to move deeper into the forward fold all while following the breath to reach a place of inward reflection and contemplation. Opening the hips, releasing the back body and lengthening the legs are just some of the many reasons to practice this gentle but powerful forward fold. 'Pigeon' pose and its many variations take us deep into the hips and the still deeper reaches of the mind. Sinking the lower body into gravity we invite opening for the hip rotators and flexors, often constricted by long hours of desk working, driving or commuting. As the hips begin to release, the spine is freed up for a delicious forward fold or an invigorating back bend. Pigeon nourishes circulation to the kidneys, adrenal glands and reproductive organs and stimulates the Vagus Nerve, the prime pathway of the 'rest and digest' nervous system. Reaching through the physical layer into the sacral chakra, and the element of water the asana provides an opportunity to release stuck emotions. We may laugh, cry or some combination of both; nothing quite teaches us where we are each day than surrendering deep into Kapotasana. Asana is devoted to the god Shiva who destroys and creates all again with his dance. Nothing is eternal in this world, there is no life without death, and we are a part of this infinite process. In mental and energy terms, it means that only by breaking old and unnecessary habits can we open the floodgates to new opportunities. Nataradjasana is stability, beauty, and openness — just like in a dance. The powerful, stable posture makes a foundation for asana, defining a basis for balance at the same time. А beautiful deep arch symbolizes openness and decisiveness required to accept something that we cannot control and to change something we are able to change. This powerful asana deeply activates and engages the muscles of the core, specifically the hip flexors, abdominals and muscles of the lower back. Creating balance and awareness, this posture builds strength as it simultaneously draws the practitioner into the present moment. Being such a challenging pose, this deep core awakener encourages attention to the breath and to the minute movements and alignments of the body. As the spine is lengthened, the sit-bones are grounded and the chest and legs are expanded in opposing directions, Boat Pose creates a firm rootedness along with a growing expansiveness and a softening of the heart center. Creating power, strength and endurance, this asana helps to improve digestion and balance and can even help to aid in stress relief. An empowering pose utilizing the whole body, it can be adapted and modified to suit yogis of all practice levels while building strength and confidence in all those who practice it. This hip-opening, twisting, lateral side-bending, forward folding posture is chock full of delicious stretches and subtle releases. Creating a hip-opening action with one foot drawn in to the inner thigh of the opposite leg, this revolved forward fold also works to create an opening in the inner hip and groin. Carefully rotating the torso to face up toward the sky, this subtle twist creates a gentle “wringing” and compression of the internal organs. Gently side-bending laterally toward the extended leg creates a deep opening throughout the side-body, lengthening the entire waistline. And, finally, a forward fold is added to deepen the releases throughout the body, encouraging length in the hips, side-body and hamstrings of the extended leg. This all-encompassing pose is an excellent release for so many different parts of the body. 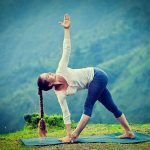 Stretching the hips, hamstrings, side-body and working even as deeply into the body as to reach the deep-seated core muscles of the psoas, this seemingly “simple” pose has so many wonderful benefits to offer. This twisting standing balance challenges even the most advanced practitioners. This posture is a hip-opener, lateral side body stretch, twist and grounding standing asana. Firmly rooting the feet to the ground in a Warrior II stance, this pose begins from the ground up creating stability and rootedness while simultaneously opening the hips in an open-hip stance of the pelvis. From here, the torso is twisted and rotated to create a deep “wringing” of the internal organs, creating compression of the abdominal cavity and a rotation of the spine from the pelvis all the way up to the neck. Finally, a side body stretch is created by lengthening the waistline away from the hip socket and extending the arm overhead, expanding and reaching through all of the muscles of the side body. This super invigorating and challenging pose works so many areas of the body, as an excellent addition to any practice. This asana offers us an interesting mixture of balance, twisting and opening that teaches us humbleness and tranquility. It is built from active and steady legs creating a foundation for this posture. Then it follows maximum extension which is the main rule and first stage of any twist. The spinal column must be free before starting to twist. Then, the body may twist, which begins deep inside the stomach before passing the baton to the thorax. Activating the spinal column all along its length and toning up activity of all internal organs, the twist ends in the cervical spine and head rotation. In the final stage, we open ourselves and look upwards. Strong legs form the basis of the posture and the body is in one plane. It forms a good balance which completes the picture. Though it’s not as flashy as arm balances, this is a nonetheless powerful pose for developing body awareness and stability. To get the most out of this beautiful pose, the hips should be squared parallel to the floor – and you learn quite quickly how difficult this can actually be. Most people move asymmetrically, so one hip will swing to the side as the corresponding leg is forward, thus denying a full stretch of the front leg. When done with balance, this pose releases all the muscles of the legs, including the hamstrings, thighs, shins, and even ankles. Because of the dynamic and interconnected nature of human anatomy, the chest stays open to subsequently support the spine, low back, and leg muscles to open, as well. By keeping the chest full and open, the spine can decompress. This deeply introspective forward fold may look quite simple at first glance. A gentle release of the torso over the legs, with a simple hinge from the hips, can work to release all of the tension and pressure from the lower back and hamstrings. Melting the body weight forward over the legs, the practitioner can surrender all of his or her tension down into the mat. Targeting the muscles of the hamstrings and lower back, this posture works to expand these areas creating space and elongation. Surrendering into oneself, Paschimottanasana is a great position to draw awareness inward and tune in with the breath. As the torso releases forward, the practitioner can move deeper toward the legs with each exhalation, truly allowing for profound release. Even in this position of softening and comfort, the core and/or arms can be activated and strengthened to draw one deeper and deeper into the fold. A posture of surrender and lengthening, this seated forward fold is an excellent addition to a cool-down or restorative practice. A foundational pose of the yogic tradition, Plank finds its way into almost every practice. Building strength and stamina, this seemingly ‘simple’ pose challenges both the body and the mind. Physically, Phalakasana strengthens the muscles of the hands, wrists, arms, and shoulder girdle as well as the back, chest, core, glutes and legs. Literally utilizing the full body, this static posture builds heat from head to toe. A great preparation for the even more challenging Chaturanga Dandasana, Plank builds the foundation necessary to practice this and many other more ‘advanced’ postures. By bone stacking the shoulders over the wrists and the back of the skull in line with the heels, Plank also helps to improve posture and overall physical awareness. Mentally, Phalakasana teaches us to empower our own breath and focus our minds. Maintaining awareness of the body and strength in alignment, Plank instills endurance and perseverance. When practiced with precision and detail, Phalakasana can improve physical strength and mental health simultaneously. This invigorating inversion requires strength, flexibility, endurance and balance, so it can challenge even the most advanced practitioners. Truly integrating and stabilizing the mobile shoulder joints, Pincha Mayurasana strengthens all the muscles of the shoulder girdles and the upper back while simultaneously broadening through the chest. Balance in this upside down pose is derived from a strong and unwavering yogic core with the help of strongly activated legs and glutes and firmly engaged arms and shoulders. Due to the fact that this pose is an inversion, it also helps to improve circulation, increase immunity by allowing lymph to move more freely throughout the body, and energizes the body and mind by increasing blood flow to the brain. Firming from head to toe, Feathered Peacock Pose utilizes just about every muscle throughout the body. But beyond even that, Pincha Mayurasana challenges the mind by literally imposing a change in perspective. Facing the fear of turning upside down with the potential to fall, forearm stand forces you to confront your own uncertainties and limitations head-on. Total awareness and control of the body and mind (with a little bit of faith on top) are essential to find stability and steadiness in this asana. This forward fold can be both cooling and restorative, or invigorating and heat inducing. Working the muscles of the front of the legs while simultaneously releasing the back of the legs, this pose is excellent for softening tension or constriction within the hamstrings. It also allows for a subtle release of the lower back as the weight of the torso is drawn toward the floor, relieving tension or chronic back pain. The arms can either be engaged or relaxed in this pose, depending on the variation of choice. So, it can be used to strengthen the biceps, for example, or to release the shoulders. This posture is also a gentle and soothing inversion as the head is below the heart, so it can have very therapeutic qualities as well as it allows the heart to rest for a moment, letting blood simply flow with the force of gravity. So, energetically, Prasarita Padottanasana cools the body and mind in a restorative way. Whether used to build fire or relax the body, this posture is beneficial for many, many reasons. Purvottasana simultaneously strengthens and stretches the full body. This ‘reverse plank’ position is the perfect counterpose to Forward Folds. Opening the frontline of the body, Upward Plank stretches the chest, shoulders and hip flexors. In a parallel manner, the back body is strengthened when practiced, firming the arms, back, glutes and hamstrings. Expanding from head to toe, this challenging posture targets muscle groups that tend to be weaker in yoga practitioners, thus it is an excellent posture to incorporate into every practice. Targeting weaknesses and creating openness in the chest and heart center, Purvottanasana also invites humility and vulnerability into the practice. A strong, stable and empowering posture, Upward Plank Pose adds an unexpected physical and mental challenge to the yoga practice. Translated from the original Sanskrit, Sarvangasana (Shoulderstand) means “pose for the entire body.” And the benefits it provides are truly universal. As with other upside-down poses, one of the main effects is the improvement of blood circulation due to inversion of the body. The curvature of the neck results in throat constriction (Jalandhara Bandha), which restricts the flow of blood to the head. In combination with the steadiness of the asana, this has a calming effect on the nervous system. At the same time, the neck area is infused with fresh blood, stimulating the thyroid and parathyroid glands. The flexibility of the cervical spine increases, while the entire vertical spine stretches upwards. The rotation of the shoulders opens up the ribcage. The arm muscles are strengthened. Variations on Sarvangasana without the elbow supports also train the vestibular apparatus. The corpse pose doesn’t mean “simply lying on the mat and resting after the session” at all. It’s a real asana, done with full presence and consciousness. Together with the relaxation of the body, allowing the muscles to rest after the physical workout of the different asanas, Shavasana completely relaxes the brain (i.e. switches off all thoughts), which brings calmness to the mind. Relaxing the whole body, being conscious of oneself here and now, focusing all attention on one’s own center and accepting all of oneself in the present without looking back to the past or ahead to the future – that’s Shavasana. This invigorating, but gentle, backbend works to open the chest and heart center while strengthening the hamstrings, back, core and shoulders. Creating Jalandhara Bandha, or the Chin Lock, this pose constricts the flow of energy throughout the body. Lengthening the neck, drawing the shoulder blades toward each other and expanding the chest all work to create openness and release within the Anahata Chakra (or heart center). The power of the legs and core supports the backbending position, allowing for the lift of the pelvis up away from the floor and the expansion of the front body. In our desk-centered world where we constantly sit in chairs hunched over a computer, this pose works wonders to reverse the actions of the spine that we hold in our typical daily posture. Expanding the front body, rolling open the shoulders and engaging the core and hamstrings, Setu Bandha Sarvangasana is the perfect posture to practice daily. Sirsasana is one of the most important poses in yoga. As a pure inversion, it changes the hemodynamics of the human body and trains the heart by asking it to work in unusual conditions. It invigorates the brain with new blood, acting as a tonic that fills us with energy. All of the body’s systems, working with gravity, are exposed to uncommon forces and forced to adapt and adjust to the new regime. The lower part of the body (particularly the legs), which are commonly the focal point of congestion and engorgement, receive additional stress relief. In the process of mastering Sirsasana, the body first and foremost learns how to achieve equilibrium – both at the physiological, as well as the mental, levels. By becoming confident with the new point of support, not to mention upside-down, we gain new opportunities for balance in different life situations. Tadasana is synonymous with personal empowerment. To understand the beauty of this pose, you need to tune in to its energetic expansions. By standing tall, you draw energy from the crown of the head through the bottoms of your active feet. You’re also running energy up your legs from the ground by engaging both the outer and inner lines, meaning both the quadriceps and the adductors. Full engagement in the feet and legs supports opening in the ribs and full, deep breath. As the rib cage fills, the core stays engaged, with a slight lift of the lower belly, which keeps you grounded and ready for anything. 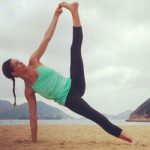 While it looks simple enough, it is a powerful pose – a strong foundation from which to create a life-changing practice. This challenging posture incorporates many different physical and mental elements. As an arm balance, hip opener, core strengthener and meditative posture, there is much to be gained from practicing Tolasana. With the legs folded into full Lotus, Scale Pose opens the outer hips by deeply externally rotating the thighbones within the hip socket, stretching the surrounding muscles. Similarly, with the legs in Padmasana, the ankles and tops of the feet are stretched as well. To further the challenge of this position, Tolasana is a lifted Lotus – the palms are planted beside the hips, the core is deeply engaged and the whole Lotus structure is lifted up off the floor into an arm balance. Due to all of these actions, the core, arms, shoulders and upper back are profoundly strengthened by this pose. If Lotus is not within your practice, this pose can still be approachable with subtle variations and modifications. Taking a half Lotus position or simply crossing the legs and drawing the knees in toward the chest as you lift can be excellent modifications for Tolasana with very similar benefits. Beyond the physical work of this posture, Tolasana is meant to be practiced in a meditative state, in which the gaze is lifted toward the third eye center (or Ajna Chakra) and all attention is focused on this higher point of consciousness. This pose acquaints you with the intricate muscles in the hips and pelvis and teaches you how they impact movement throughout the legs. A special opportunity of this pose is in its opening of the adductor muscles. Few other poses open the adductors quite like Upavistha. Long periods of sitting or other inactivity can create imbalances in the hips, which this pose can correct. There are many large and small muscles in the hips that affect overall range of leg motion, and the external rotation of Wide-Angle Pose improves mobility in this area to improve posture overall. Emotionally, this pose also teaches you to stay in presence and out of frustration. Many a yogi has tried to force opening in the hamstrings and lower back, which is as fruitless as trying to force a budding flower to bloom. The reward is not in bringing the chest fully to the floor; the reward is in tracking your own, unique opening. And that is something that no-one else gets to experience – and celebrate – than you in the sanctity of your own practice. Heart-opening poses are essential in a modern life filled with hunching over keyboards and rushing from one thing to the next. Urdhva Danurasana is a particularly deep heart opener that counter-acts these ills of modern life to create expansive freedom in your body and mind. Wheel also improves flexibility in the back, chest, shoulders and thighs. It can also aid digestion by creating a deep stretch of the abdomen and entire front body. While heart-openers require a bit of vulnerability, the other side to that is trust in yourself. Wheel is about learning to trust in this power as it strengthens the muscles of the spine. You learn to trust in the literal opening of your heart safe in the knowledge that the strength of your spine – the strength of your convictions – will hold you. Up Dog is one of the most commonly utilized postures in the Ashtanga Vinyasa practice. Flowing between Chaturanga Dandasana and Downward Facing Dog, this excellent backbend is much more than just a transition. Strengthening so many muscles of the body, Up Dog engages the feet, legs, hips, core, back, chest, arms and even the neck. Pressing down firmly into the floor to lift the whole body away from it (except for the tops of the feet and the palms), this heart-opener requires great strength and muscular control. While strengthening, Up Dog also works to create space and elongation in the front body, creating a subtle stretch for the ankles, hip flexors, abdominals, chest and the front of the throat. A heart-opener, full body strengthener and stretcher, Upward Facing Dog, or Urdhva Mukha Svanasana, is a definitely a useful pose to keep in your asana arsenal. Practised with awareness and patience it can bring us to that place of union, which is yoga. Bending backwards towards gravity in 'Camel' we build deep strength in the yogic core, while simultaneously stretching the entire front-line of the body; from the thighs and hip flexors to the intercostal muscles and throat. In a forward flexing culture of desk-hunching and long hours spent in transit, our cramped spines crave such a full and nourishing extension. Ustrasana reminds us to be aware of the breath – to open to the breath and stimulate the flow of prana for digestion, circulation and uplifted mood. Nowhere is the body-mind connection more apparent than in camel. Leaning back into the unknown, while expanding the heart centre to the world, we awaken a sense of vulnerability which can be both liberating and challenging. Though it’s a static pose, Utkatasana will quickly get your heart pumping if held for long enough. Because of its shape, Utkatasana is sometimes called Thunderbolt Pose, so you shouldn’t be surprised to feel lightning in your thighs after holding it for several rounds of breath! This pose is a reliable way to strengthen your thighs while challenging your posture. The shoulders should stay back to keep the chest open and free, which becomes challenging as the muscles tire after a while. Perhaps more than anything, Chair Pose challenges you to stay present and connected to your breath, no matter how urgently your muscles try to distract you. By staying present in the pose, Utkatasana builds stamina and resilience, which are gifts you can take with you long after you’ve left the mat. In Uttanasana, we are humbled and grounded. In this deeply respectful pose, we bow and draw upon grounded energy by reaching for the earth. With an elegant bend at the hips or waist, the entire back body has space to open. The spine is elongated as the nerves are restored; the low back is relieved from the heavy weight of the upper body; tight hamstrings are free to soften. All the while, the brain and nervous system are calmed and the blood is oxygenated from the gentle inversion. A challenging balance posture, Utthita Hasta Padangustasana utilizes both strength and flexibility. Firmly rooting down into the standing leg while simultaneously lengthening up through the spine, this pose recruits the muscles of the core and legs to maintain stability while balancing on one leg. With the top leg extended forward away from the body, the hamstrings and hips are extended and lengthened working deeply into the practitioner’s flexibility. With the assistance of the hand and arm to hold and help maintain the lift of the extended leg, the arms and shoulders are exercised and strengthened, as well. Creating a strong and stable base in the standing leg and a supple and mobile extension in the lifted leg, all while stabilizing the muscles of the core and activating the arms and shoulders, Utthita Hasta Padangustasana is clearly a full-body workout that can challenge even the most advanced practitioner. With elements of balance, strength and flexibility, this pose particularly draws awareness to the subtleties of the breath and the sacred balance between effort and ease. The geometry of 'extended triangle' is well worth exploring for its dual sense of grounding and expansion. As one of the few asanas offering lateral flexion, it is a staple for a healthy spine; re-setting imbalances in its supporting musculature and harmonising the nervous system. In Trikonasana we learn to build steady foundations through the feet, ankles and legs and invite space into the hamstrings, paving the way for steadier balancing poses and sweeter forward bends. Lengthening and strengthening the waist and torso against the draw of gravity opens the breath into the side ribs, belly and sacrum; circulating prana into the abdominal organs and kidneys for a sense of rejuvenation and lightness. Nothing illustrates quite like 'side plank' and its variations that yoga is not about bulging muscles, but mindful alignment and an interconnected strength that radiates from a strong core. Stacking the body along its edge against gravity, with respect for our own body's limits, provides an opportunity for building bone density. Equanimity of upper and lower body strength is called for and an honesty in stabilising the shoulder girdle, which serves us well for inversions. Vashistasana is the place to take a deep breath into the self belief and will power of the fiery manipura (naval) chakra. In being with the trembling we build mental resilience and focus; in smiling through the wobbles we lesson the hold of an ego that keeps us apart from our true union. With the support of the earth, this pose reminds us that we are safe in our own skin. Softening into the ground, perhaps aided by the use of props, we’re free to surrender in release for the hips and spine. It reverses the pull of gravity on your blood, thereby relieving the legs and feet and guiding blood back towards the heart. Viparita is a deeply nourishing pose for the mind and nervous system. If held for a long time, you have space to focus on the deep, slow breathing that triggers the body’s natural relaxation response. In this space, we enter a state of deep rest that helps decrease heart rate, blood pressure and tension. Entering this pose means entering a healing space. It’s a reliable way to rejuvenate tired bodies and soothe stressed minds. This pose signifies arrival and a summons to our alert, relaxed instinctual selves. With arms stretched skyward, strong, grounded feet provide a solid foundation from which to lift the ribs. A steady front leg holds weight while a long back leg runs energy all the way from the hip through the heel. Doing so creates intercostal space between the ribs and freedom of subtle movement throughout the torso. Finally, like the warrior, relaxed shoulders and a long, soft neck radiate an alert, relaxed, ready-for-anything presence. This empowering posture embodies the fierceness of a warrior with the softness of yogi. A strong standing balance, this asana creates an open-hip position in the lower half of the body that helps release hip tension while simultaneously strengthening the legs and the pelvic girdle. As the back body is lengthened in opposing directions, the practitioner creates space throughout the spinal column to allow pranic energy to flow freely up and down. Extending firmly out through the arms, Warrior II also tones and strengthens the muscles of the arms, shoulders and upper back. Stabilizing the body, the core works diligently in this pose to find balance and stability while also protecting the integrity of the lower spine. Utilizing the full body, this posture both lengthens and tones, stretching some muscles while strengthening others. Empowering and powerful, Warrior II is a firm and rooted posture that creates both a sense of grounding and power in those who practice. Warrior III asks a lot of you, including strength, flexibility and body awareness. While in this pose, yogis can channel a divine intention to hold themselves accountable to their dreams and a fearlessness in pursuing them. The challenge of the pose is in its call for strength in the shoulders, thighs, calves and back. Because the limbs can start to feel heavy, a strong core and abdominal connection is also required to prevent weakness in the low back. The chest should stay lifted, with breath moving easily and powerfully from the lungs all the way to the tips of the fingers and toes. All the while, keeping a solid drishti (gaze or focal point) to maintain balance and steadiness. Transition in life is inevitable. Tree Pose reminds us that we can choose to stay graceful and poised, no matter how hard the winds of change may blow. The standing leg can represent the strength of your convictions, the root of your tree. From the connection of the foot to the earth and the strength of the ankle, calf and thigh, there is freedom of movement in the torso. Outstretched arms act as branches, moving slightly with micro shifts as the body intuitively finds its balance. Though you could choose to become frustrated in finding your balance, this pose invites you to calm your mind and develop balance and focus, physically, mentally, and spiritually.